Ubisoft revealed, today, that Assassin’s Creed: Rogue will definitely be making it way onto PC, and not just the previous generation of consoles. It’s set to arrive at some point early next year, the publisher told IGN. It’s due out in a couple of weeks on PS3 and Xbox 360, almost at the same time as Unity hits PC and next-gen consoles. The explanation for the large gap between the PC and console releases of Rogue is “production reasons”. For those who, like me, felt that Black Flag was the best the series has ever been, Rogue might be of greater interest than Unity. 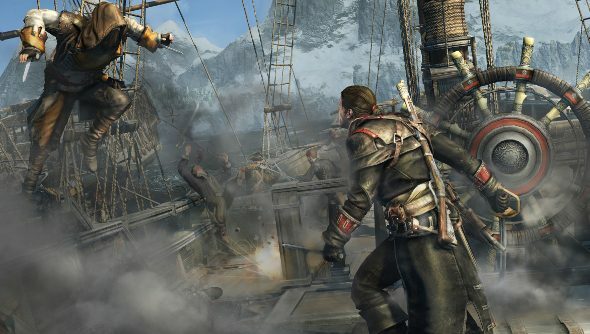 While the next game in the main series is set in Paris during the French Revolution and is closer to the original Assassin’s Creed, Rogue is a nautical tale of revenge set in the North Atlantic, and beyond. Rogue will also put players in the shoes of a Templar, rather than an Assassin, and will contain modern day sequences as well. How these modern bits work, and whether they are closer to Desmond’s awful adventures or the Ubisoft self-parody of Black Flag remains to be seen, as the publisher is being tight-lipped. Hopefully, the aforementioned “production reasons” that are holding back the PC version mean that we can expect an upgraded version of the game to grace PC, rather than a simply, direct port from the dated consoles.